Hi Bob, this was the view outside our home yesterday with a nice summer thunder lightening storm. Loved it! This text went with your youtube video. With the Suns magnetic waves cancelling, this will usher in fewer sunspots, more coronal holes and increased possibilities of huge CME's and EMP's. As you have all see these last few months are absurd with the weather amplification on our planet. I have broken down Zarkova's, Potpov's, Zarkov's and Shephard's research to show how much more amplification there will be in Earths weather patterns heading into 2021. This is a Head's up for anyone living on the East Coast. We have one hurricane forming and probably two more will form behind it. For most of this summer, much of the U.S. has been hit by historic heatwaves, crippling drought and unprecedented wildfires. But if the long-term forecasts that I am about to share with you are accurate, this winter could be bitterly, bitterly cold. The sun appears to be entering into a period of early hibernation, and that is a very troubling sign. The primary driver of climate conditions is the giant ball of fire that our planet revolves around, and that ball of fire is beginning to behave in irregular ways. Sunspot activity is way, way below what was expected for this year, and that is one of the reasons why so many are calling for a “big freeze” this winter. And if we experience an extended “solar minimum”, that could mean significantly reduced temperatures and crop failures all over the planet. At other times in history, such a scenario has meant global famine. But for the moment, most of the focus is still on the extremely hot and dry summer that we have been enduring. According to the National Oceanic and Atmospheric Administration, 131 million people in this country are currently experiencing “abnormal dryness and drought”. An increasing number of cities face extreme heat for much of the summer, with highs surpassing 100 and even 110 degrees for weeks at a time. Even in the final days of August, Phoenix is sweltering at 107 and San Antonio at 104. Such relentless, triple-digit temperatures — the equivalent danger of rising seas in many coastal communities — are straining power grids, buckling roads, grounding planes and endangering lives. The Phoenix area reached a dubious record last year: at least 155 heat-related deaths. At the same time, there has been very little rain in the Southwest, and that has resulted in historically bad drought conditions. Scorching heatwaves across the United States have contributed to massive wildfires, and to make matters worse the dry weather has also led to extreme droughts. Large chunks of the country are now facing dire times due to the droughts. According to Drought.gov – the official monitor of droughts in the US – 10 states are facing “extreme” or “exceptional” droughts, the highest categories in the ranking system. If you go to U.S. Drought Monitor, you can see that the worst drought conditions are in areas that also experienced the Dust Bowl of the 1930s. Many believe that we are witnessing the return of Dust Bowl conditions, and that has very serious implications for the future of our nation. Meanwhile, this has also been one of the worst years for wildfires in our history. It is being reported that over 100 wildfires are currently burning around the nation, and that includes three of the largest fires in California history. A lot of people are blaming all of this unusual weather on “global warming”, but what will they say when things get bone-chilling cold this winter? The Farmers’ Almanac is predicting a “colder-than-normal” winter from the Continental Divide on eastward, with “teeth-chattering” cold arriving in mid-February in the Northeast, Great Lakes, and even into the Southeast. The Farmers’ Almanac has been right before, and that is because they are looking at the same scientific data that everyone else can access. Scientists are reporting that the sun has been free of sunspots for a total of 133 days this year, according to The Express UK. With only 241 days of 2018 passing, that means the sun has been blank for the majority of the year. Experts continue to warn that this is a sign that the solar minimum is on its way. “The sun is spotless again. For the 133rd day this year, the face of the sun is blank,” wrote the website Space Weather.“Solar minimum has returned, bringing extra cosmic rays, long-lasting holes in the sun’s atmosphere, and strangely pink auroras,” the website continued. Solar minimums usually happen on a very regular schedule, but once in a while there is a “prolonged solar minimum”, and that can be really, really bad. Could we be facing such a scenario once again? I have repeatedly warned that weather patterns are changing and that our planet is becoming increasing unstable. Supplies of key natural resources such as food, oil and fresh water are already being stretched very thin, and it isn’t going to take very much to produce a devastating global crisis. For the moment things may seem somewhat stable, but signs of trouble are all around us. So let us hope for the best, but let us also get prepared for the worst. 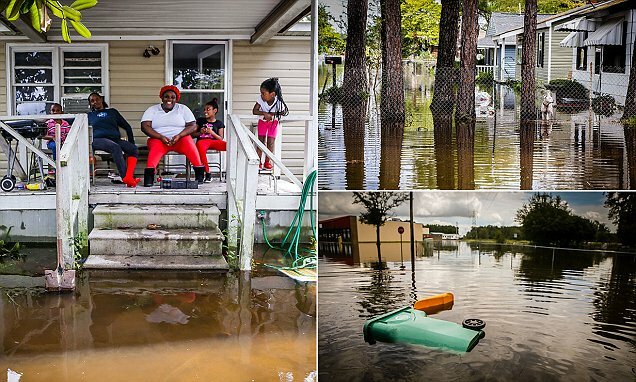 Small North Carolina town becomes an ISLAND after Hurricane Florence dumped two feet of rain in 48 hours as the storm's death toll rises to 32. In North Carolina, fears of what could be the worst flooding in the state's history led officials to order tens of thousands to evacuate, though it wasn't clear how many had fled or even could. In Lumberton (above), most of the town was inaccessible from flooding. Trucks and SUVs were risking rising flowing waters to rescue people. A makeshift levee of 5,000 sandbags was created on Friday by National Guard and city employees, with local people pitching in to help. By Sunday, that levee had been breached. Flooding is seen near mile marker 387 on Interstate 40 in Duplin County, North Carolina on Monday. Many of those killed in Palu were swept away by giant waves more than 10ft high as they played on the beach in the scenic tourist town. The number of casualties was no doubt increased by the fact that hundreds of people had descended on Palu's beach for a festival to celebrate the city's anniversary, due to start Friday night. 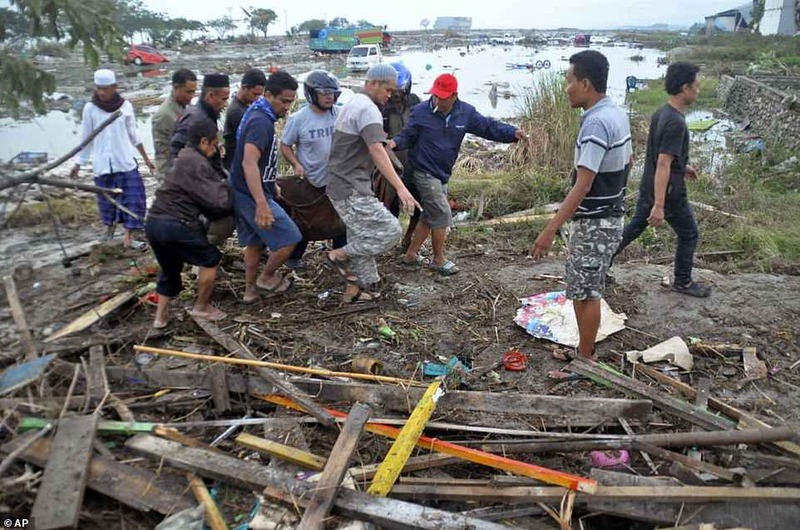 'When the (tsunami) threat arose yesterday, people were still doing their activities on the beach and did not immediately run and they became victims,' Sutopo Purwo Nugroho, spokesman of Indonesia's disaster mitigation agency BNPB said in news briefing in Jakarta. 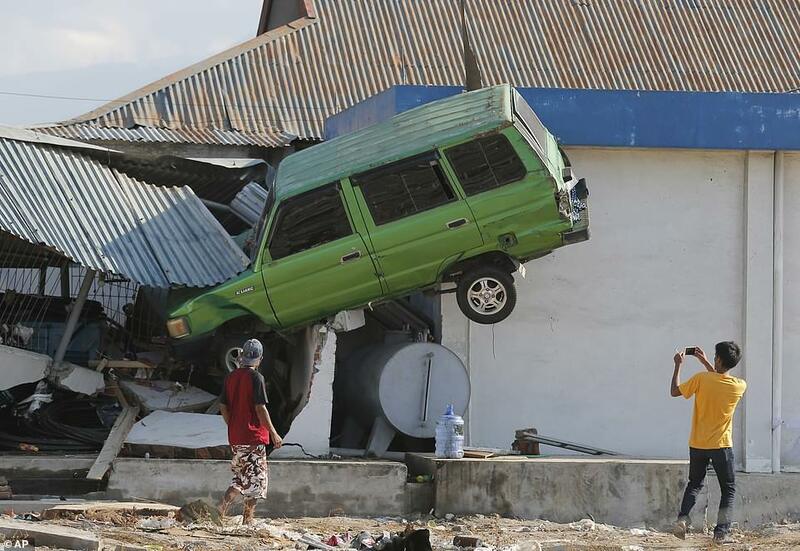 The first earthquake was of 6.1 magnitude and hit Indonesia's densely populated region on Friday morning, quickly followed by even fiercer 7.5 magnitude tremors which caused the terrifying waves. The National Disaster Mitigation Agency warned early on of reports showing that 'victims died in the rubble of a collapsed building'. I was Recording Footage of Region 10s Entrance gates, and not even 2 minutes in an unmarked car rolls up and asks me if I need any help, and that I should remove my self. Then as I am walking back to my truck, FEMA security rolls up on an ATV type cart and Questions me...This ended up being the most shocking part of it all. 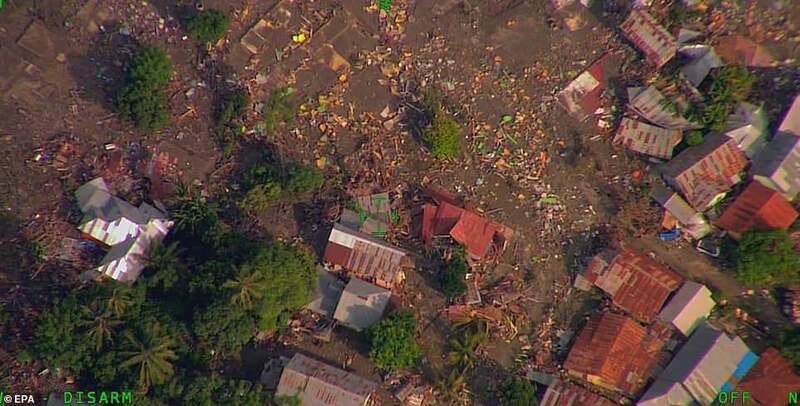 Communications were down across the Indonesia island of Sulawesi on Saturday after a powerful 7.5 magnitude earthquake and subsequent tsunami decimated communities across central Sulawesi, leaving scores dead and hundreds of buildings destroyed in the city of Palu and the surrounding area. 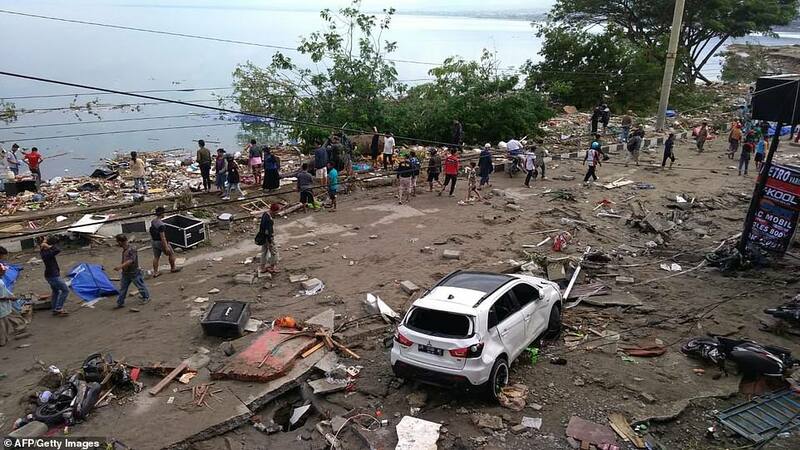 According to Agence France-Presse, at least 384 people died in the city of Palu, which was among the hardest-hit cities in the disaster. At least 540 have been injured, and 29 are listed as missing. The death toll is expected to swell since tens of thousands of Indonesians were visiting the city for a festival. 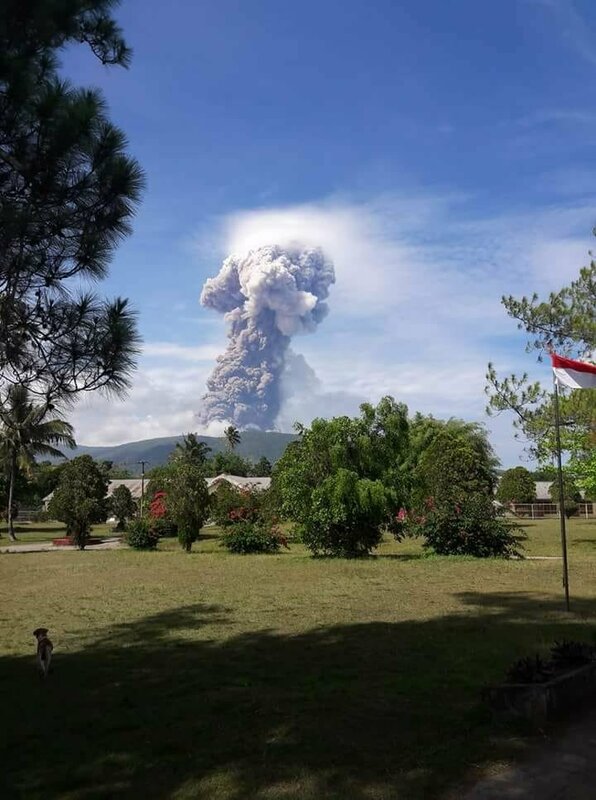 Officials warned that the death toll was likely to rise as many more remote towns in the region have proven difficult to reach, including the city of Donggala. A landmark city bridge was among the list of destroyed music in Palu as waves up to 10 feet high swept across the city. The quake struck near central Sulawesi at a depth of 10 kilometers just before 1100 GMT, early in the evening local time. Such shallow quakes tend to be more destructive according to Philippine Star. 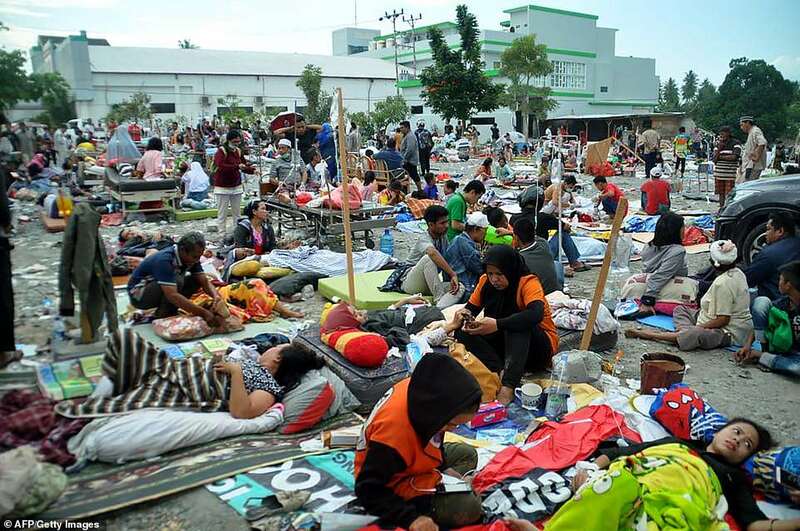 It was more powerful than a series of tremblors that struck the island of Lombok and neighboring Sumbawa in July and August, leaving hundreds dead and tens of thousands displaced. Photos and video of the earthquake, tsunami and their aftermath depicted piles of debris where buildings once stood, and corpses strewn across the ground. One particularly gruesome photo showed a man carrying the muddy corpse of a small child. Indonesian President Joko Widodo told the press that the military was being called in to help search-and-rescue teams save victims and find bodies. 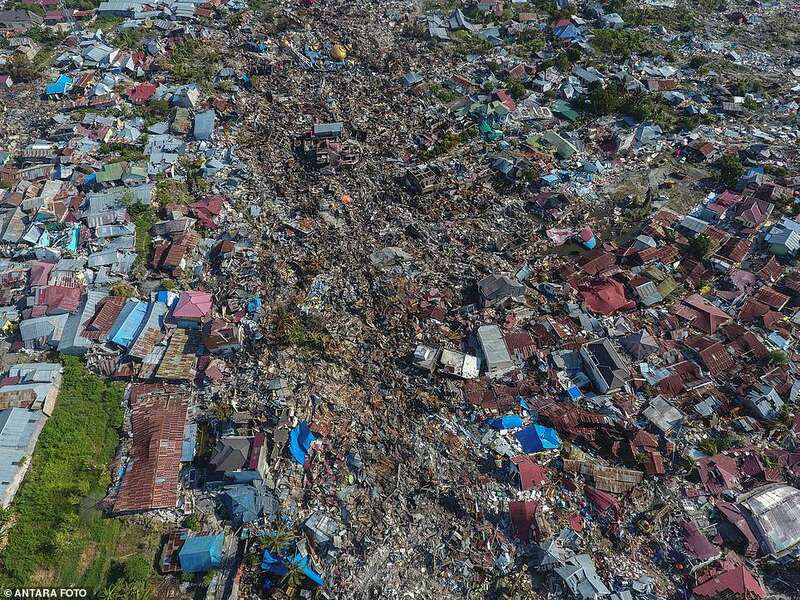 A spokesman for the government’s disaster recovery agency told reporters that telecommunications were damaged by the quake and a subsequent storm, adding that the government hoped international satellites would be able to provide backup. “We hope there will be international satellites crossing over Indonesia that can capture images and provide them to us so we can use the images to prepare humanitarian aid,” the spokesman said. People living hundreds of miles from the quake’s epicenter said they felt the quake, which followed a smaller jolt that killed at least one person. Marshall Masters is a former CNN Science Features news producer, freelance writer, television analyst and the publisher of YOWUSA.COM. 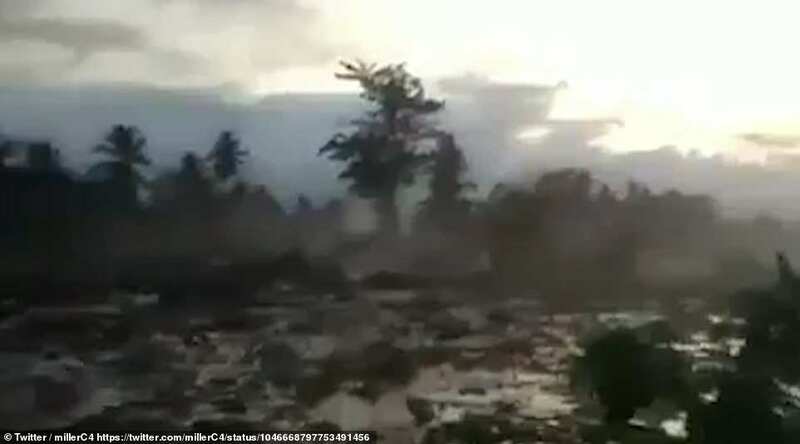 Hundreds are feared trapped in mud and 1,700 homes were 'swallowed up' on Sulawesi, Indonesia after tremors turned water-filled soil in to mush in a phenomenon known as liquefaction. Terrifying footage, filmed from the metal roof of a house, shows large buildings and electricity pylons moving past just yards away after being ripped from their foundations. The clip emerged as the death toll from the disaster climbed to more than 1,200 and officials prepared a mass grave with space for hundreds of earthquake and tsunami victims. Workers were seen hauling body bags into the 330ft-long tomb in Palu. Some remote areas feared wiped out by the disaster have yet to be contacted, medicines are running out and rescuers, who have reported hearing screams from under building wreckage, are struggling with a shortage of heavy equipment. In response, President Joko Widodo opened the door to the dozens of international aid agencies and NGOs who are lined up to provide life-saving assistance. 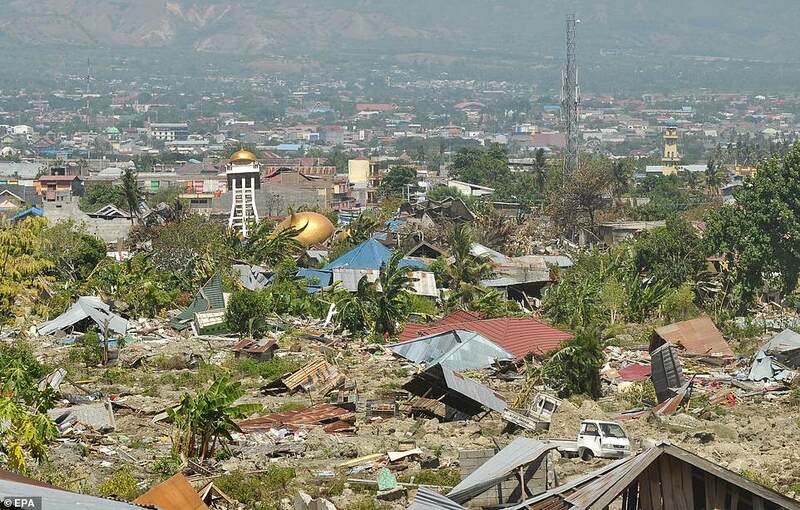 Britain will send a team of five aid workers to Sulawesi along with £2 million of support to help the thousands left homeless, the Department for International Development (DfID) confirmed. "Eric Dollard is the Yoda of electricity and a modern day wizard. His accomplishments are far more impressive than I had initially thought. I have posted a video but there is far more I shall release. Eric speaks truth to power and shatters lies with every word he speaks. There are active agents of suppression working against people like Eric Dollard and Tesla before him. These agents are shadowy and have great power. They can shatter the best laid plans of the individual. My hope is that we the people working together can triumph over them. Those that don't believe that such powers exist should look for another worthy campaign to aid. Those looking at this as an investment, look elsewhere as this is not a mere charity campaign but a bold declaration of defiance to the powers that be! http://ericpdollard.com - This presentation by Eric P. Dollard has been uploaded by others and was mis-titled as "The Theory of Anti-Relativity". That title is actually a paper by Eric and this presentation is the History and Theory of Electricity. Eric Dollard's nickname for this presentation is "Explosion in the Shipyard" because of one story shared. Eric Dollard gave this presentation at the Tesla Society around 2007. There were no geomagnetic storms in the last few days, however auroras lit up the sky in Alaska. Spectacular auroral displays also reported from Norway, Finland, Iceland and Canada. "We had amazing auroras for over 3 hours non-stop," reports photographer and aurora tour guide Marketa Murray, who took the picture just outside Fairbanks. "It was a night to remember." At the time of the display, there was no geomagnetic storm in progress. "The solar wind speed was relatively low (380 km/s) and the K-index was only 2," she notes. "But 'B sub Z' was -5 nT, so the auroras appeared." B sub Z was - 5 nT? In other words, an equinox crack opened in Earth's magnetic field. Solar wind poured in to fuel the display. At this time of year, even weak streams of solar wind can spark bright auroras around the Arctic Circle--no geomagnetic storm required. "B sub Z tips south"
After months of increased seismic activity, the Soputan volcano finally blew off steam on Wednesday morning, sending an ash column as high as 4,000 meters into the air. Ash plumes are now moving in the west and northwest direction, with an alert level III issued for the active volcano.. Communities residing within a 6.5 km radius of the summit are being advised to stay clear of the area due to potential threats of lava flow and dangers from the ash clouds..
Officials warn of 'worst storm in living memory' to hit the region as more than 375,000 people are told to evacuate. Residents and tourists were told to flee low-lying areas in at least 20 counties along the shore in Florida's Panhandle and adjacent Big Bend region. Meteorologists said it had the potential to become one of the worst storms in the history of the region. It comes as a satellite image of Michael took the terrifying shape of a skull as it roared closer to the Florida Panhandle as a fierce Category 4 storm. The sinister-looking red and gray skull appeared briefly on the National Oceanic and Atmospheric Administration infrared satellite images. The University of Georgia's Marshall Shepherd, a former president of the American Meteorological Society, called it a 'life-altering event' on Facebook and said he watched the storm's growth on satellite images with growing alarm. Hours after making landfall—and making history—as one of the most powerful U.S. hurricanes on record, Hurricane Michael was still a serious threat as it moved across southen Georgia on Wednesday night. As of 8 pm EDT, Michael was about 20 miles southwest of Albany, Georgia, with Category 1 sustained winds of 90 mph. Michael entered the state's southwest corner as a Category 3 storm, making it the first major hurricane in Georgia since 1898. Michael left a trail of destruction in its wake across the central Florida Panhandle, especially along and near the coastal stretch from Panama City to Apalachicola. One death had been reported as of Wednesday evening. 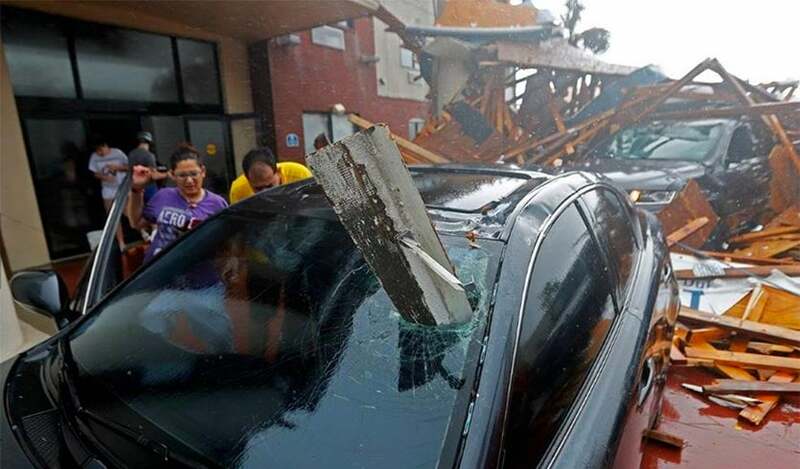 Mexico Beach, which encountered the worst of Michael's dangerous right-hand-side eyewall, appears to have been particularly hard hit, as was Tyndall Air Force Base, which reported "extensive damage" in a Facebook post. For more on Michael's damage, see this weather.com roundup. Flash floods and powerful winds will remain a threat from Michael as it accelerates northeastward Wednesday night and sweeps across the Carolinas on Thursday. Tornadoes will also be a threat, especially northeast of Michael's center on Thursday across the eastern Carolinas. A tropical storm warning extended north along the Atlantic coast on Wednesday night all the way from Fernandina Beach, FL, to Duck, NC, including Palmico and Albemarle sounds. Michael will weaken steadily tonight, but it is expected to remain a tropical storm until it moves offshore from the Virginia/North Carolina coast into the Atlantic late Thursday or early Friday. At that point, it will restrengthen while evolving into a non-tropical cyclone. A final stripe of very heavy rain could develop from southern Virginia into the Delmarva area as Michael departs. At 2:12 pm EDT, the storm tide at Apalachicola, FL peaked at 7.72’ above high tide (Mean Higher High Water, or MHHW), which was the highest water level on record there (going back to 1967). Hurricane Dennis of 2005 (a 6.43’ storm tide) held the previous record. The highest storm surge at the site (height of the water above the normal tide) was 8.53'. NHC predicted a storm surge of 8 - 14 feet for this portion of the coast. At 2:06 pm EDT, the storm tide at Panama City, FL peaked at 5.31’ above MHHW, which was the second highest water level on record. The record was 5.72’ above MHHW, set on October 4, 1995 during Hurricane Opal. The highest storm surge at the site (height of the water above the normal tide) was 5.62'. Records extend back to 1973 at the site. At 2:54 pm EDT, the storm tide at Cedar Key, FL peaked at 4.05’ above MHHW, their 6th highest water level on record. NOAA buoy 42039, located about 90 miles (145 km) south-southwest of Panama City, Florida, reported sustained winds of 60 mph (97 km/h) and a wind gust of 76 mph (122 km/h) at 5:50 am, before the buoy stopped transmitting data. The highest significant wave heights were 30.8 feet at 4:50 am EDT. Tyndall Air Force Base, which got the western eyewall winds of Michael, reported sustained winds of 86 mph, gusting to 129 mph, at 12:19 EDT, five minutes before the station stopped sending data. This measurement was taken at 30 meters, so is higher than the winds that would be reported from the standard 10-meter measuring height. According to NHC, a wind gust of 130 mph was reported between 1 - 2 pm EDT at a University of Florida/Weatherflow observing site near Tyndall Air Force Base before the instrument failed. A wind gust of 129 mph (207 km/h) was reported at the Panama City Airport. The peak sustained winds of a hurricane (in the case of Michael, estimated at 155 mph) typically affect only a small area, and instruments may not be in place to capture those peak winds, so we shouldn't be surprised if the highest sustained wind reports from Michael near ground level end up being less than 155 mph. For more on how hurricane winds are assessed during and after a landfall, see our two-part report from earlier this year. At Donalsonville, Georgia sustained winds of 45 mph, gusting to 56 mph, were measured at 3:15 pm EDT, fifteen minutes before the station stopped sending data. At Albany, Georgia, sustained winds of 51 mph, gusting to 70 mph, were measured at 7:24 pm EDT, and the winds were still increasing. Even veteran meteorologists were astounded by Michael’s ultimate fury. The estimated sustained winds at landfall of 155 mph are at the very top end of Category 4 strength. Unlike most hurricanes, Michael continued to intensify right up until it made landfall just northwest of Mexico Beach around 1 pm EDT. Michael had struggled all day Tuesday to carve out a clear eye and a closed eyewall, yet the hurricane still managed to intensify. Once the closed eyewall formed on Tuesday night, Michael’s strengthening really took off. The brief life of Michael’s closed eyewall meant that there wasn’t quite enough time for an eyewall replacement cycle to kick in, a process that could have weakened the storm’s top sustained winds by 20 – 30 mph. On the contrary, Michael’s inner structure was at its most impressive right when the storm made landfall: the hurricane’s eye was amazingly distinct on satellite even after it was completely onshore. This viral Facebook video from Stefan Melendez shows what it was like to be on the ground Wednesday as Michael’s clear eye passed overhead and the sun shone. The tweeted video below gives a pilot’s-eye perspective of the same thing. Michael’s central pressure at landfall was estimated by hurricane hunters at 919 mb, and the Univ. of Florida/Weatherflow station near Tyndall AFB measured a central surface pressure of 920 mb. The only two hurricanes in U.S. history known to make landfall with a lower central pressure were Mississippi’s Camille (1969, 900 mb) and Florida’s Labor Day Hurricane (1935, 892 mb). Both of these were Category 5 storms at landfall. The nation’s only other landfalling Cat 5 on record was Andrew (1992, 922 mb). Andrew was initially classified as a Category 4, then upgraded in 2004 after the storm was reanalyzed. 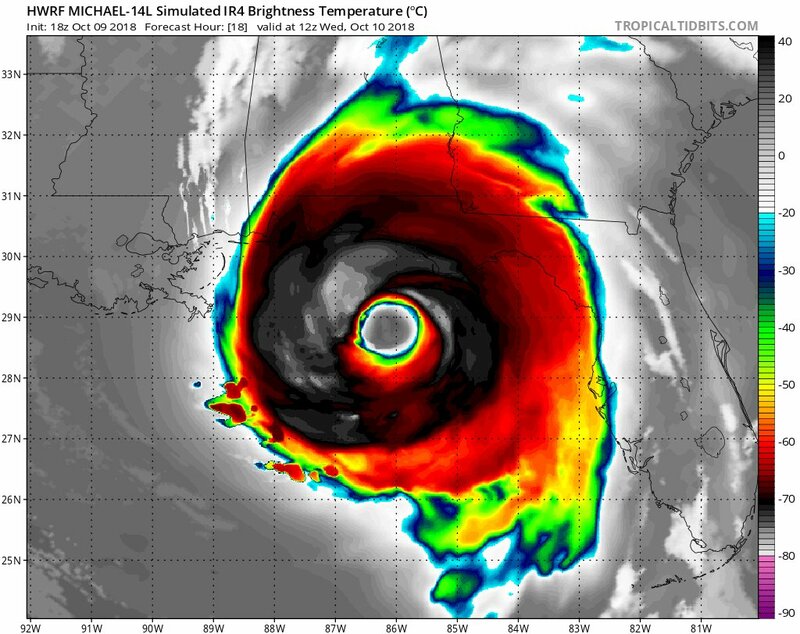 It’s possible that the National Hurricane Center will find enough evidence to similarly promote Michael, but we’ll have to wait and see on that. Another very close contemporary of Michael’s would be Hurricane Maria from 2018. Maria struck Puerto Rico with a central pressure of 920 mb and peak winds of 155 mph. One important reason Michael got so strong is that very warm water (around 29°C or 84°F) extended to some depth across the Gulf and extended all the way up to the northern Gulf Coast, a rarity for mid-October. More typically, at least one or two cold fronts have chilled the waters just off the Florida Panhandle coast by this point. Florida just experienced the warmest September in its history, a sign of the overall atmospheric and oceanic warmth that’s prevailed across the region over the last few weeks. As human-produced greenhouse gases continue to warm our climate, it’s reasonable to assume that waters warm enough to support an intense hurricane will be present over larger areas and over longer stretches of the season. Michael came ashore more than a month later in the season than all six of the previous strongest mainland hurricanes in U.S. history (as measured by central pressure at landfall). Many studies have shown that we can expect an increasing proportion of Earth’s hurricanes to reach intense levels as the climate warms. In addition, at least one study has found that hurricanes and other tropical cyclones have tended to intensify more rapidly over the last 30 years. See the Climate Signals website for more on the links between hurricanes and climate change. Michael also developed at a pace very well suited for a powerful landfall, with upper-level conditions aligning at just the right time for Michael to strengthen. As noted above, the hurricane struggled to form a closed eyewall on Tuesday even as the central pressure steadily dropped and powerful thunderstorms (convection) pulsed throughout the storm’s central core. As noted by Philippe Papin (U.S. Naval Research Laboratory), a shallow layer of dry air injected into the southwest side of Michael’s circulation about 4 – 5 miles high may have interfered with the eyewall closure. Even so, it appears that the moisture and convection that congealed on Tuesday laid the groundwork to Michael to vault to its top-end Category 4 ranking once Michael's eyewall finally closed on Tuesday night and the moderate wind shear in place for most of Michael’s life briefly relaxed. We can be grateful for at least one thing: had Michael reached its top strength a day or two sooner, or moved more slowly, the storm surge could have been even more intense than it was. ABOUT THE CURRENT WEATHER WARFARE. WAKE UP!! THIS IS NOT NORMAL!! Hurricane Michael Pretty amazing videos of the energies of the weather being manipulated! 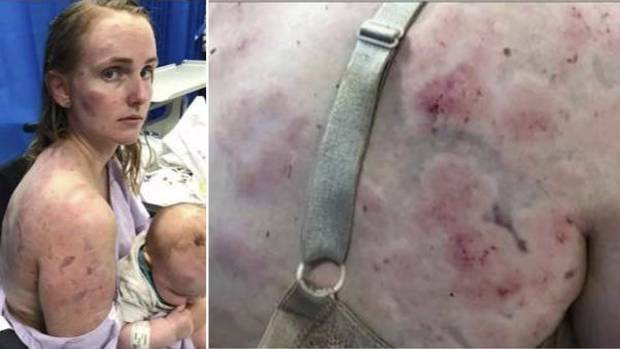 An Australian woman has been left bruised and battered after being pelted by hailstones that had smashed her car's windows during a violent storm in Queensland. Some farmers lost entire crops, and Tansey resident Greg Hellmuth told Today the noise was unbelievable. "So we ran inside and everything was going sideways, all the trees were going sideways. We went under the mattress and that's where we stayed." Two supercells hit southeast Queensland on Thursday, causing widespread damage and bringing tornados. 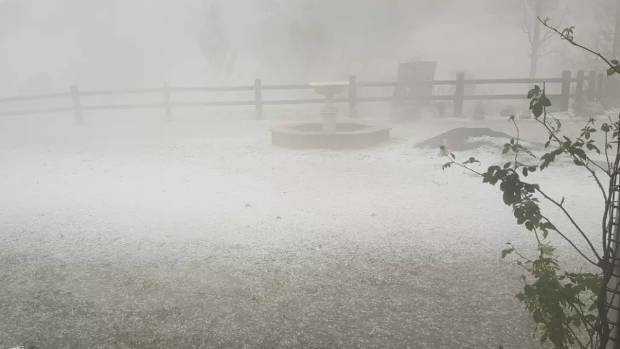 Along with the hail, there was flash flooding, with some people reportedly trapped in cars for several hours. Roofs were ripped up and roads cut by fallen trees. Some farmers lost entire crops, and Tansey resident Greg Hellmuth told Today the noise was unbelievable. "So we ran inside and everything was going sideways, all the trees were going sideways. We went under the mattress and that's where we stayed." "When we opened the door it was just devastation," Hellmuth said. MICHAEL'S PATH OF DESTRUCTION: Newly obtained drone footage shows Hurricane Michael's extensive damage to Mexico Beach, Fla., after the powerful storm made landfall Wednesday ... Debris and sand-covered streets, destroyed buildings and flooding are among the devastation shown in the video. More wreckage, including displaced boats and shattered roofs, are also visible along a body of water dotted with docks. The drone also shows an open stretch of what appears to have once been waterfront homes and buildings. Meanwhile, officials said Tyndall Air Force Base in Panama City, Fla., suffered “severe damage” to “the base infrastructure." The storm also brought flash flooding to hurricane-weary parts of the Carolinas and Virginia. Approximately 1 million customers in Georgia, Florida, Alabama and South Carolina lost power. 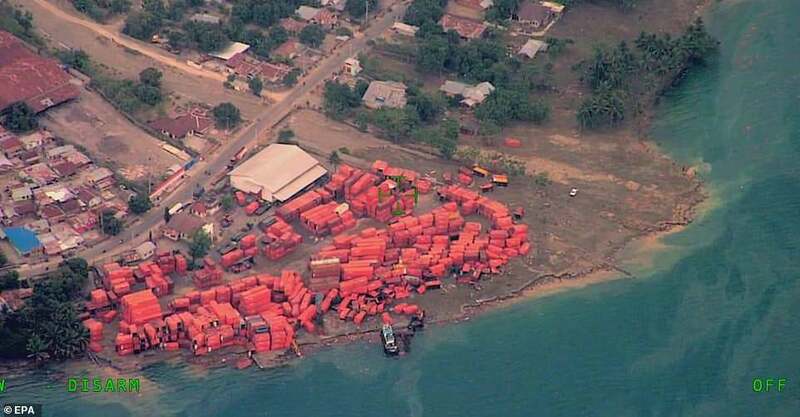 Authorities estimate the storm caused at least $8 billion in damage. Winter Comes Early.. no kidding. It snowed at our home on 10/9 and the mountains behind the house are covered in snow. We had only 2 days of Indian summer. Current temperature is 29 degrees. A freeze warning was issued for Chicago as temperatures were predicted to drop even lower than expected for the arrival of fall. Friday morning could see temperatures dip to the upper 20s and lower 30s, according to the National Weather Service. The warning is in effect from 1 a.m. to 9 a.m., although freezing temperatures could possibly return in the evening as well. The areas affected include Chicago, the north and west suburbs and northwest Indiana, the weather service said. Earlier, the upcoming cold front was only expected to dip to the high 40s. Due to a frost advisory, owners of sensitive outdoor plants were asked to move the vegetation inside or cover it, the NWS said. His report today is worth the watch.